A brief guide to the jargon in retail planning. Convenience goods. Items you need daily or weekly. Food beverages, tobacco, alcoholic and non-alcoholic beverages, newspapers and periodicals, non-durable household goods. Comparison goods. Things you might shop around for. The list includes clothing, DIY, household appliances, tools, pharmaceutical products, games, music and so on. GIA. Gross internal area – the area within the store’s walls. Also called gross retail floorspace. GOAD. Experian Goad is a retail property intelligence system that helps retail developers and investors identify profitable locations for retail property development and investment projects. Edge of centre. For retail purposes, generally a location that is well connected and up to 300 metres from the primary shopping town centre area. Footfall. The number of people entering a shop or shopping area in a given time. Impact test. Where a retail development is over a certain floorspace threshold, developers must provide an assessment of the impact of the proposal on existing shops in the town centre and in the catchment area. The impact assessment must also consider “the impact of the proposal on town centre vitality and viability, including local consumer choice and trade in the town centre and wider area.” This impact would normally be measured over five years, but ten years might be appropriate for large schemes (NPPF26). Further details of the impact test are provided in national planning guidance (NPPG1-18). The floorspace threshold in Ludlow will be 300 sq metres once SAMDev is adopted. Until then it is set at 2,500 sq metres under the NPPF. Linked trips. Once people park up and visit a supermarket, they often go to shop in other stores. These are linked trips. NIA. Net internal area – the area available for shopping. Also called net retail sales area. NPPF. The National Planning Policy Framework sets out government’s planning policies for England and how these are expected to be applied. NPPG. The National Planning Practice Guidance which accompanies and helps interpret the NPPF. Overtrading. The level at which a store is trading above a national benchmark for the retail company. Out of centre. A location which is not in or on the edge of a centre but not necessarily outside the urban area. Out of town. A location that is outside the existing urban area. Primary shopping area. Defined area in town centre where retail development is concentrated. Sequential approach/test. “Local planning authorities should apply a sequential test to planning applications for main town centre uses that are not in an existing centre and are not in accordance with an up-to-date Local Plan. They should require applications for main town centre uses to be located in town centres, then in edge of centre locations and only if suitable sites are not available should out of centre sites be considered. When considering edge of centre and out of centre proposals, preference should be given to accessible sites that are well connected to the town centre. Applicants and local planning authorities should demonstrate flexibility on issues such as format and scale” (NPPF24). Town centre. 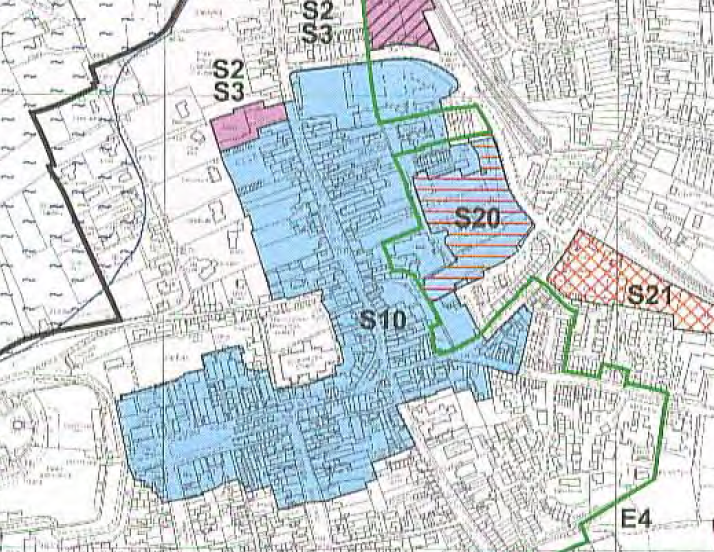 The area defined on the local authority’s proposal map, including the primary shopping area and areas predominantly occupied by main town centre uses within or adjacent to the primary shopping area. The relevant map for Ludlow. Town centre uses. Retail, offices and leisure including restaurants and bars. Use classes. Development is divided into categories, shops, offices, houses, etc., known as use classes. Shops are class A1. The General Permitted Development order allows some uses to be converted to another without planning permission (further details). Sources: NPPF; Planning for Town Centres; Planning Portal.